Google Nexus 5X and Nexus 6P owners will remember the disappointment when getting the official Android 8.0 Oreo update and not getting features like Night Light and automatic Wi-Fi wakeup. The latter feature was introduced with the Android Oreo update for the Google Pixel and Pixel XL. What it does is automatically turns on Wi-Fi to connect to a high-quality saved network. The feature isn’t available for all Android Oreo devices as OEMs have to choose to enable it, but it will be available for all devices running Android Pie! Update 8/9/18: The title was updated to clarify that the feature is now available for all, not necessarily enabled by default for all. It’s still optional and can be enabled or disabled by the user! With the release of Android Pie and the code drop on AOSP, we spotted two changes that enable this feature for all devices launching with or upgrading to Android 9 Pie. The first commit simply enables it on all devices by changing the value of config_wifi_wakeup_available in the AOSP framework from 0 (false) to 1 (true). A follow-up commit removes this flag entirely as its now enabled by default in Android Pie. If you compare config.xml in the Android frameworks/base branch for the android-8.1.0_r43 tag versus the one in the android-9.0.0_r3 tag, you’ll see that the “Turn on Wi-Fi Automatically” flag is no longer present. Even custom ROMs based on Android Pie will have the feature enabled without having to make any changes whatsoever. For a quick refresher on how this feature worked in Android Oreo, it takes advantage of the “Wi-Fi scanning” feature in Location Services to detect Wi-Fi networks in the background. 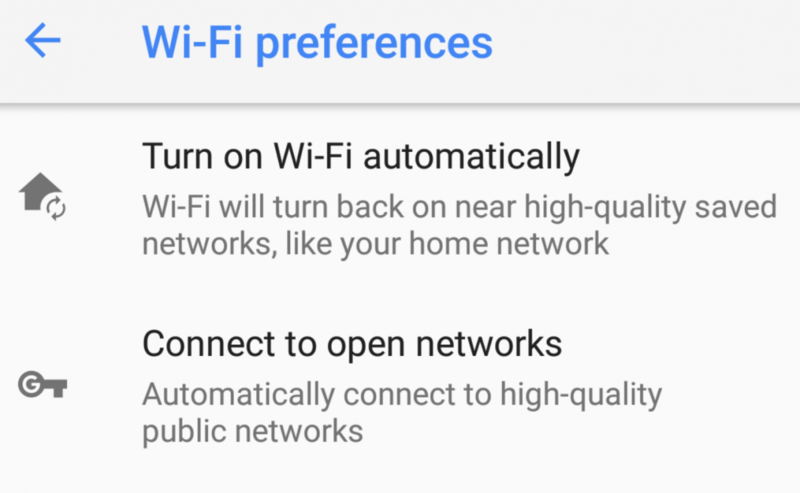 It checks these Wi-Fi networks against Google’s recommendation service, and if the recommendation service determines the Wi-Fi network is trusted (saved network) and high-quality (based on connection quality, network speed, etc. ), then your Android device will fully turn on Wi-Fi and automatically connect to the network. This actually ends up saving battery if you live in an area with a ton of Wi-Fi access points, because the alternative is leaving Wi-Fi on which causes your phone to constantly connect to and disconnect from low quality, open Wi-Fi networks. We’re not sure how this feature works in Android Pie as it no longer uses the network recommendation service, though.